Yesterday Rep. Paul Ryan (R-WI) introduced a budget proposal that would slash $1.2 trillion from public investments in education, science, and infrastructure that are essential to U.S. economic growth and competitiveness. Both public and private investments are critical components of long-term economic growth. Investment spurs job creation and economic growth in the short term while boosting productivity growth and living standards in the long term. Public investment is crucial because many investments—while yielding large returns to the country as a whole—do not offer the kinds of incentives that will entice the private sector to invest. Without that investment, we are all worse off. On the other hand, when we as a country make public investments in schools, roads, and scientific research, we all benefit from a more innovative, more efficient economy. That is why the conservative budget proposed yesterday by Rep. Ryan would hurt our economy. If enacted, Rep. Ryan’s budget could put the brakes on three straight years of job growth, during which the U.S. economy created a total of 6 million new private-sector jobs. Moreover, our analysis shows that the Ryan budget will rob Americans of future economic opportunities by slashing close to $1.2 trillion of investments in education and skills training, science and technology research and development, and transportation infrastructure in the decade between 2014 and 2023. This year’s proposed budget is just as bad for investments than the $1.4 trillion in investment cuts Rep. Ryan proposed in 2011 and the $871 billion he proposed in 2012. Economists assess prospects for economic growth by looking at how investment per capita grows over time—the more capital goods, skills, and knowledge people have to work with, the more productive and creative they can be. At a minimum, investment should keep pace with population growth and inflation and replace depreciated past investments as they wear out from normal use. 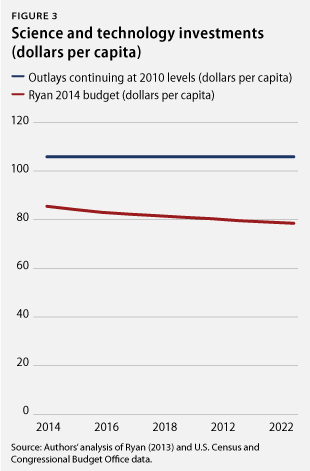 By cutting the very investments that make for a strong economy, Rep. Ryan’s budget is a plan for economic weakness. His proposed cuts to investments will lead to slower job creation, higher costs for businesses, and fewer Americans gaining the skills they need to get good jobs. In this way, the plan puts at risk America’s ability to successfully compete in the world economy. Investment provides the foundation for job creation, economic growth, and a strong and prosperous middle class. Investments—in new scientific research, new factories, transportation infrastructure, and the education and health of our workforce—contribute to growth by putting new technologies to work, lowering costs for businesses, and increasing the productivity and competitiveness of American workers. These kinds of public investments can revolutionize the way we live our lives and conduct business—just think of the interstate highway system, the Internet, and medical treatments for cancer and HIV/AIDS. Even before the Great Recession began in December 2007, investment in the U.S. economy was too low. In the 2000s, under former President George W. Bush’s policies that directed tax cuts at the wealthiest Americans—and tax and regulatory cuts at big corporations—private business investment experienced the slowest growth of any economic expansion in postwar U.S. history. The pace of investment in the U.S. economy fell from 18 percent of gross domestic product, or GDP, in 2000—the total value of goods and services produced by workers and equipment in the United States—to 16 percent in 2007, the eve of the Great Recession. Investment plunged to just 11 percent of GDP in 2009, as the financial crisis and the bursting housing bubble took its toll—and before the Recovery and Reinvestment Act of 2009 helped reaccelerate investment to 13 percent of GDP in 2012. Amid faltering U.S. investment under President Bush’s ineffective policies in the 2000s and the political gridlock since then, other nations have raced ahead. China and India, for example, are making remarkable strides in educational quality and attainment, allowing them to rapidly converge on advanced-economy countries such as the United States. In 2007 China surpassed the United States in their annual number of science, technology, engineering and mathematics, or STEM, graduates. And by 2030 China will have more college graduates than the entire U.S. workforce. While our competitors continue to bolster their public investments, American infrastructure and education are crumbling for want of resources, creating real economic costs for businesses and families. According to National Science Foundation figures, federal investments in research and development fell from 1.1 percent of GDP in the early 1990s to 0.8 percent of GDP in 2009, the last year for which data are available. 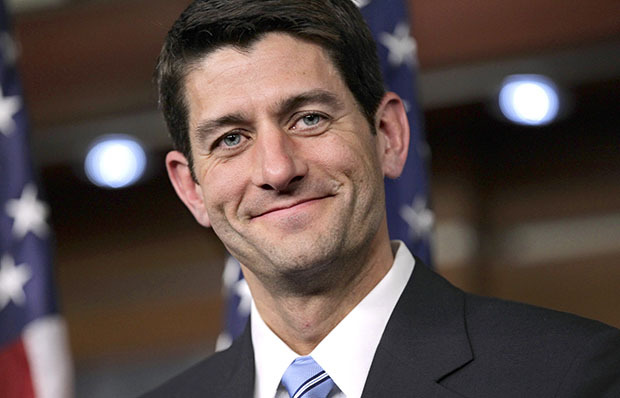 Rep. Ryan’s plan to disinvest in the United States by $1.2 trillion could not be more ill conceived. Instead of laying the foundation for productivity and economic opportunity in the United States, the Ryan budget takes us in the wrong direction—disinvesting in the American economy to give tax cuts to the richest of the rich while allowing the foundations for sustained private investment to crumble. We compare this House budget plan—for public investments in education and training, transportation and infrastructure, and science, space, and technology—to merely maintaining funding for federal public investment at the same level it was in 2010—before conservative cuts began undermining economic growth. 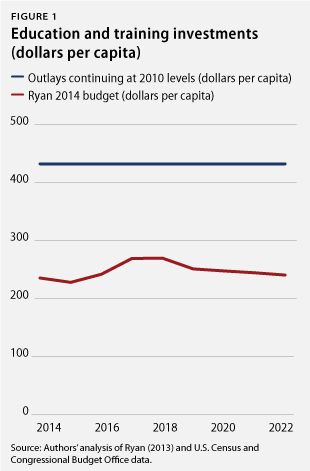 The projected constant-level investment figures are compared to the shrinking investment levels proposed by Rep. Ryan, adjusted for inflation to 2013 dollars, and expressed in per capita terms. For the good of U.S. economic growth and prosperity, investment would ideally go up, as is the case in many competitor countries. But even viewed against the low bar of keeping investment at the same 2010 levels, we can see just how steeply the Ryan budget cuts critical investments. The details of the proposed cuts are equally alarming. The Ryan budget cuts per capita investment in education and training by 47 percent, cutting from the 2010 level of $433 per person to a mere $238 per person by 2023. (see Figure 1) This proposal would cut investments from K-12 education nationally, including education for children with disabilities and investments in educational innovation. These cuts also would take away resources from programs that help American workers achieve higher skills and better opportunities by promoting adult education and literacy, career and technical education, community colleges, postsecondary education, and student aid. Cutting such investment will mean that fewer people will have access to the education and skills training they need to fuel economic productivity and compete for good, secure jobs in the labor market. The Ryan budget disinvests in transportation infrastructure investment per capita by 32 percent of 2010 levels, cutting from $312 per person down to $210 per person by 2023. (see Figure 2) Investments to improve and repair the nation’s interstate highway system, public transportation, aviation, railroads, and inland waterways will suffer under these proposed cuts. Our nation’s failure to invest in infrastructure in recent decades has resulted in longer commute times, billions of dollars in gasoline wasted sitting in traffic, frustrating airport delays, and rising energy costs that hit working families and business owners alike. To make matters worse, other countries have been making substantial public investments in infrastructure, improving their relative competitiveness in the global marketplace. Investments in science and technology research provide a critical foundation for innovation systems in the U.S. economy overall. 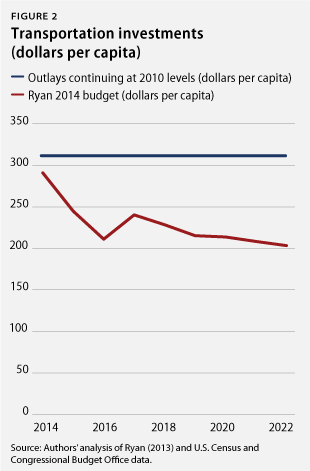 The Ryan budget cuts per capita investments in science and technology research and development by 28 percent. While we invested $105 per person on research in 2010, the Ryan plan would cut science research to $78 per capita by 2023. (see Figure 3) Federal funding for the broad-based scientific research and development programs at the National Aeronautics and Space Administration, the National Science Foundation, and general science programs at the U.S. Department of Energy historically provided numerous technological innovations that have revolutionized our economy but which also provide critical research and development resources to support private industry. In total, the Ryan budget proposal would strip close to $1.2 trillion from public investments in education, infrastructure, and science and technology—investments that create a foundation to support private investments and a more productive economy with greater opportunities and broader prosperity. America’s long-term economic growth and competitiveness depend on raising public and private investment from the low levels of the past decade. By disinvesting in the sources of productivity and competitiveness to pay for tax cuts for those Americans who are already wealthy, the Ryan budget plan undercuts America’s economic future. Sarah Ayres is a Policy Analyst with the Economic Policy team at the Center for American Progress. Adam S. Hersh is an Economist at the Center.